JT Splatmaster is a low impact, outdoor shooting game for kids under 10 years of age. 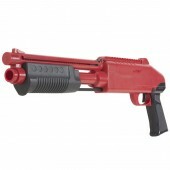 The JT Splatmaster guns use spring power to shoot a small .50 caliber paintball, specially designed to shoot at low velocities (140-160 feet per second). The low velocities make JT Splatmaster safe for younger children (properly supervised, and wearing proper eye protection) to be able to shoot targets (and other participants) in the backyard. JT SplatMaster There are 5 products.